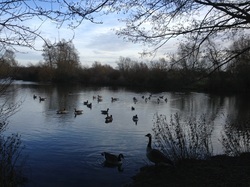 West Stow Country Park has an amazing variety of beautiful things to see. You can walk along the river Lark, around the lake, in the forest, or across heathland. It is a great place to spot wildlife, with abundant places for birds to nest. You can spot Lackford lakes from the banks of the river, where a multitude of birds can always be seen, or West Stow lake itself, which is a very popular fishing spot. There are several routes to take around the park, so you can have slightly different scenery each time you visit. Most of the routes have clearly defined paths, but they are natural paths so can be muddy when it has rained. You can bring dogs, but only on a lead. The facilities at West Stow are fantastic. They have outdoor toilets, and toilets within the café, with changing facilities. There is an enormous and very well stocked playground, which is always extremely popular and busy in school holidays. The café has a good selection of light lunches, snacks and drinks, with plenty of space for toddlers to wander around and several high chairs. The visitor centre itself is the entrance to the famous Anglo Saxon village, which is a very popular tourist attraction for school-aged children. They are working on creating more activities for younger visitors. There are chickens and pigs to see and the buildings themselves are fascinating to small explorers. They have an archaeological mini dig area, and a museum with various interactive sections that the children can touch and try on. The car park has a pay and display charge, of £2.00 for over an hour, but it is well worth getting a season ticket for only £15.00. We have just bought a Heritage Ticket, which covers the whole family (up to 5 family members, including at least 1 adult and 1 child!) for £30, which gives you unlimited access to West Stow Anglo Saxon Village, and Moyse's Hall Museum in Bury St Edmunds, as well as a parking ticket for both West Stow and Nowton Park. You also get free entry to living history and event days, except where otherwise specified, discounts on talks, walks and workshops, and special offers in the café and shop. The First English Village: One of England’s great archaeological sites. With extensive indoor galleries and a stunning recreation of an Anglo-Saxon village, West Stow is a fascinating and enjoyable day out for all the family, come rain or shine. West Stow's remarkable wooden homes were rebuilt using ancient Anglo-Saxon methods on the exact sites of the original Anglo-Saxon settlement after extensive archaeological surveys. Inside, the sights and the smells of a past world make the centuries fall away. From the first humans to the Romans, Vikings and more – gems from digs across West Suffolk. Plus insights into the cutting edge of 'experimental archaeology' as investigations continue at West Stow. Explore the Anglo-Saxon huts, watch an historical film, dress up as an Anglo-Saxon or say hello to the rare breed pigs and chickens. The archaeological mini-dig is also now open daily from 11am-4pm - kids love it! There are also lost of events held at West Stow, from ancient battle re-enactments to craft demonstrations and story-telling to bushcraft activities - see What's On to find out more about events at West Stow! Daily tours of West Stow Anglo-Saxon Village are available; please call to confirm before travelling - 01284 728718. The Angles Café at West Stow is open daily and serves Costa coffee. Keep hold of your car park ticket stub and receive 10% off in the café! We recommend you pencil in from three hours to a day for your visit to West Stow.